"Come out and have a great time, great food, and see some really great cars. There are also train exhibits, a museum with interactive exhibits for children, and bluegrass music provided by The Cadillacs. 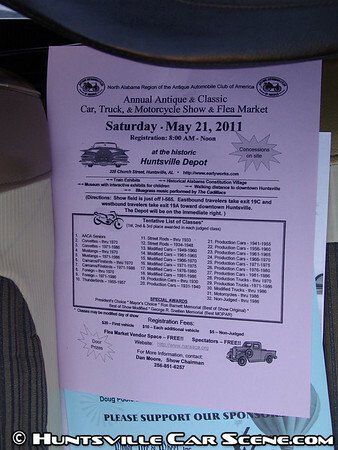 There will be door prizes and other give-aways, a flea market and, of course, lots of cars, trucks, and motorcycles." Registration for this event is $20 for the first vehicle and $10 each additional vehicle. 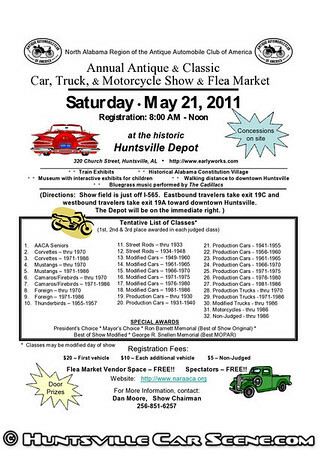 Registration for non-judged vehicles parked in the show is only $5. Registration ends at noon with judging and trophy awards following. Vendor spots and spectators are free! In addition to the show there will be door prizes and concessions on site. Also live Bluegrass music performed by The Cadillacs. 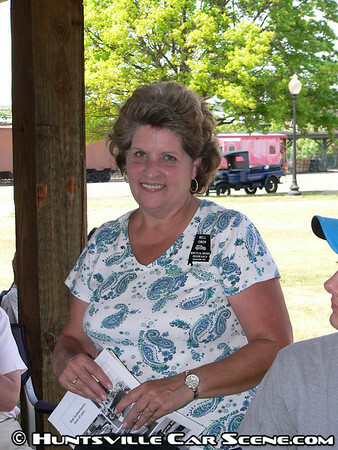 The Huntsville Depot features Train Exhibits, and interactive exhibits for children. You're also walking distance to downtown Huntsville and other points of interest like the Historical Alabama Constitution Village. There are numerous competition classes for vehicles up through 1986. 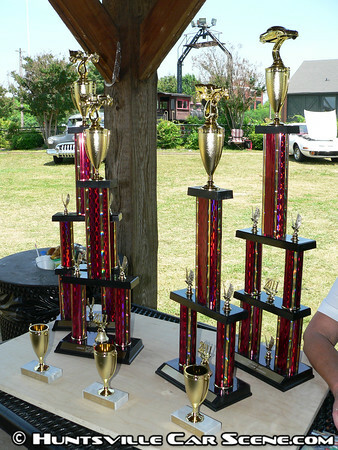 Judged classes include production & modified cars and trucks, street rods, and foreign vehicles. There are separate classes for Corvettes, T-Birds, Mustangs, Camaros/Firebirdvs, and the ever popular (non-judged) AACA Seniors class. The tentative list of classes is the following. There will be 1st, 2nd, and 3rd place awards to each class. Classes may be modified the day of the show. A nice breeze kept everyone cool even though it was pretty hot. The heat may have been one of the factors that contributed to the slightly lower car count this year, but people still recovering from the storms, the economy still being an issue, and several other shows in the area where probably bigger factors. 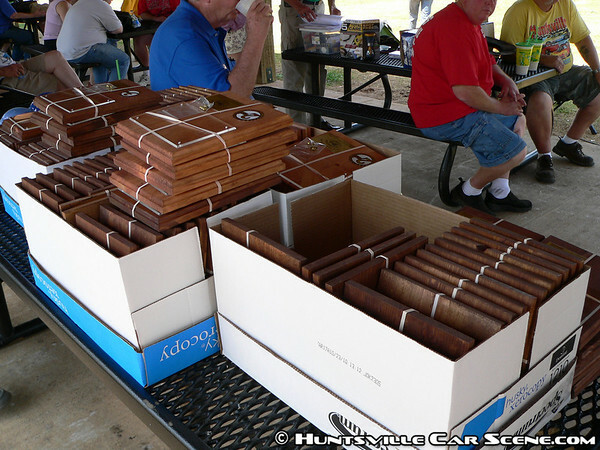 Nevertheless, there was still plenty for everyone to see with over 80 cars on display. 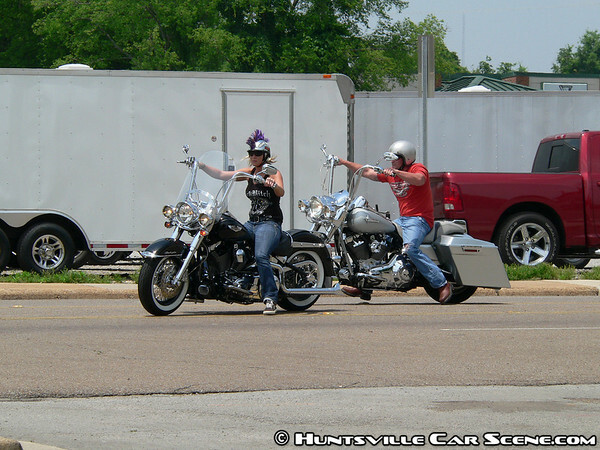 And even some two-wheeled friends made their way to the show to check out the cars. It was a great day to ride. 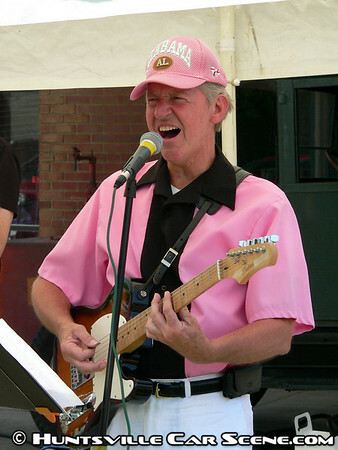 The Caddilac's rocked the house while Mike was MCing this year, giving Nell a bit of a break. 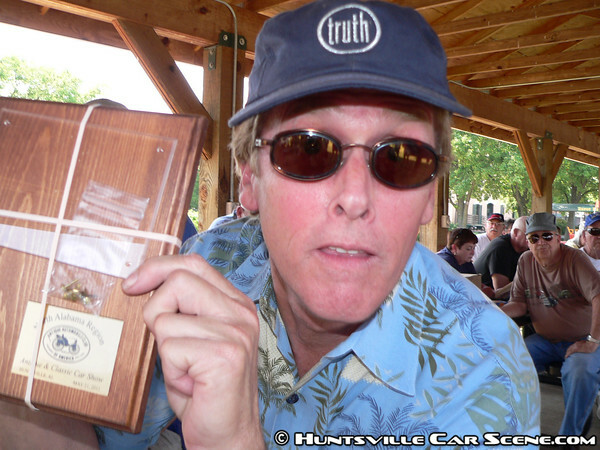 Bob MC'd the awards ceremony, and I want to thank Bob, Mike, Nell, and everyone at NARAACA for their support of Huntsville Car Scene. It really means a lot when the organizations HCS tries to support in turn support HCS. I also want to thank Mike from the Hope Church Cruise-In for his help while I took pictures of the cars. They're going to be having their annual cruise-in in a few months, so keep an eye out for it. There were several awards with a good number of participants placing. And of course, Danny to ham up his award presentation like only he can. Mayor Battle had a funeral to attend later in the day so he couldn't stay to present the trophy for Mayor's Choice. 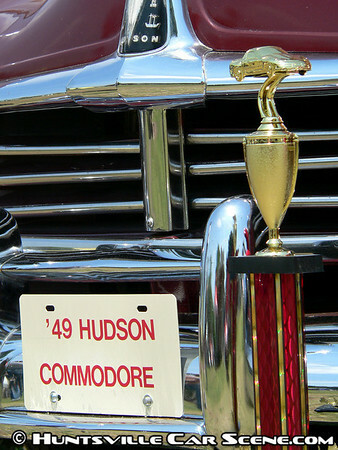 The award went to Nell for her 1949 Hudson Commodore. Nell was quite shocked as he usually picks something from the Muscle Car era. I didn't know we had a small auto museum at the Depot and was able to explore it a bit this year. 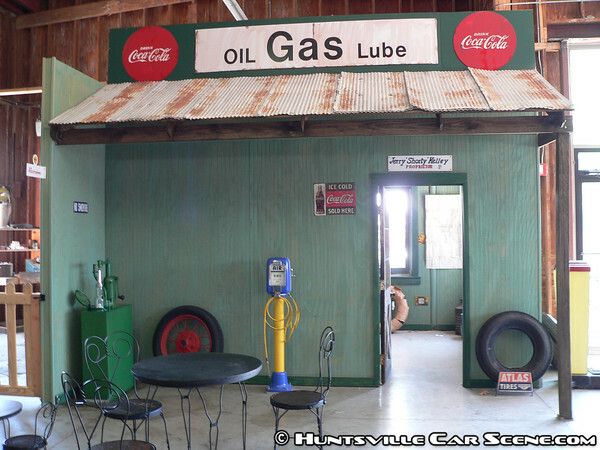 Inside, you'll find a small service station, complete with items that would have been found there at the time, as well as some vintage gas pumps and an old International Harvester pickup truck. 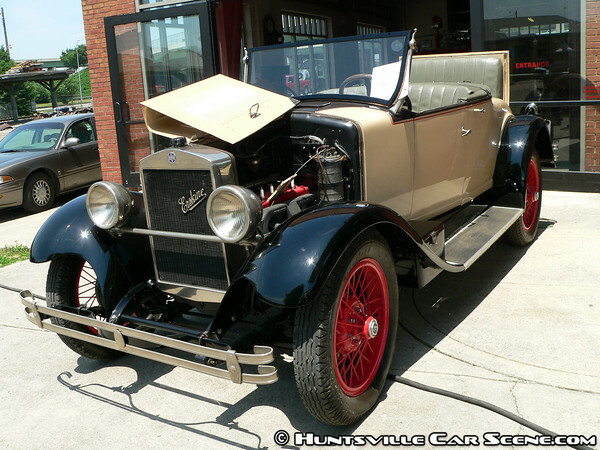 I also learned a bit about Huntsville's own tie to automotive history via this 1927 Erskine Model 50 J Roadster. According to this plaque inside the museum, this roadster is only 1 of 6 ever manufactured and was originally in Zurich, Switzerland before making its way here to Huntsville. The Erskine name sounded to familiar to me, but I initially didn't know why. 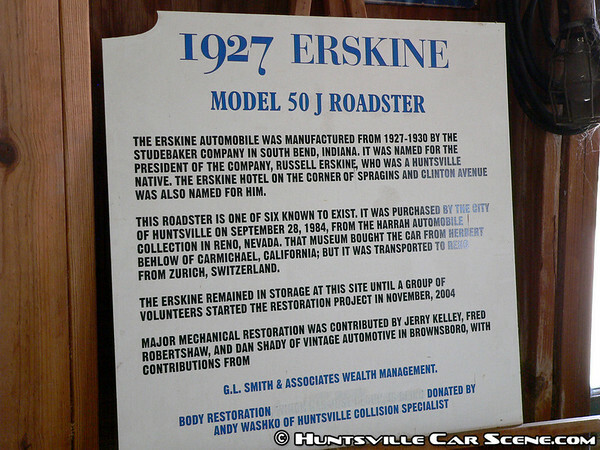 Huntsville native Russell Erskine, the same Russell Erskine whose name is on the Russell Erskine Hotel downtown, was the President of Erskine Automobile. 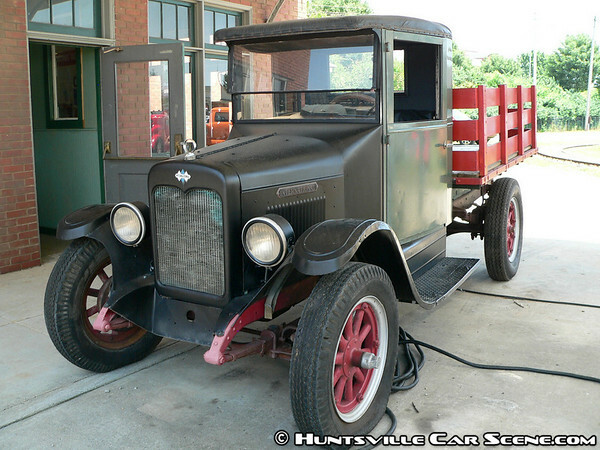 The cars were manufactuered by Studebaker in South Bend, Indiana from 1927 to 1930. What a perfect event. Some great looking cars in the sun and great people, as well as a bit of learning too. See everyone next year!